Whether you agree that our country has a shortage of qualified STEM (Science Technology Engineering Mathematics) applicants per job available or not, it is a subject that is growing in popularity. ExxonMobil’s “Be an Engineer” campaign inspires people to be engineers in order to solve problems and make cool things. We grew up learning about career goals like “doctor” and “lawyer” and even “construction worker” but not quite enough about the jobs behind the scenes. A child of 5 that says he wants to be a biomedical engineer would probably be looked at as a genius or crazy. 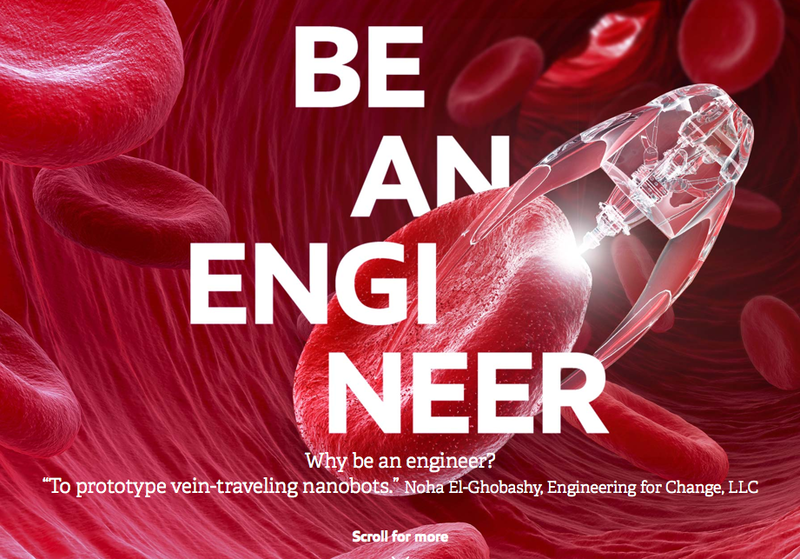 This campaign, along with other guiding forces like GoldieBlox, puts engineering in human terms. This campaign was a smart business move because it helps with positioning. Fuel is a mundane product, but this is the perfect way for ExxonMobil to stick in people’s minds. The website is informative and does not directly tout the benefits of ExxonMobil’s products at all. As a bonus, it cannot hurt for employer branding. It shows that the company has an eye out for the larger labor market and does not just try to sell candidates on perks. Great engineers will (ideally) feel drawn to this campaign (or threatened by it, haha). But how do you measure a campaign like this? It seems to be more about goodwill and PR than sales, and that’s okay.